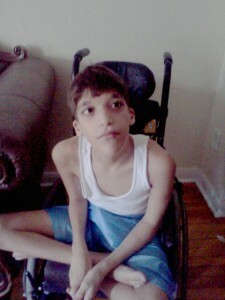 Meet Christian, a young man who was diagnosed with cerebral palsy and seizure disorder. He also battles Hirschsprung’s disease, an illness which affects the colon. In addition, standing or trying to walk puts him at a severe risk of falling. Christian faces many obstacles each day such as being confined to using a wheelchair, which is very difficult for him to maneuver. This valiant boy has fun whenever possible. He watches television and his favorite program is the timeless cartoon, Winnie the Pooh. Very few characters capture Christian’s heart like the kindness of the silly ol’ bear. Christian also enjoys going to the beach or park where fresh air and sunshine are nature’s cure. Christian needs a lightweight adaptive stroller, which will allow him to be more comfortable and easily be active throughout the community. Please help soon!